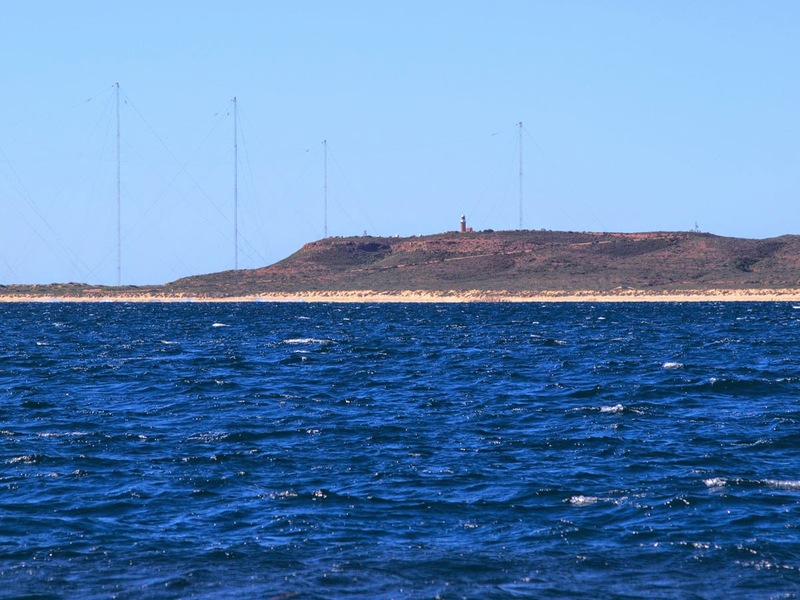 NW Cape, note radio towers (US Military). With a boisterous SE wind behind us we zoomed out of Tantabiddi and headed for the North West Cape, top left corner of the continent. We finished with the Western coast of WA, 800 miles from Geographe Bay in the South. Guess who holds lease on the patch of land that is the Cape? The good ole’ USA. They built their super duper radio aerials for their eastern hemisphere military comms during the cold war in 1967. The state government decided to gazette a new town too, so the thriving metropolis of Exmouth (pop. 2,500) came into being a few miles down the road. 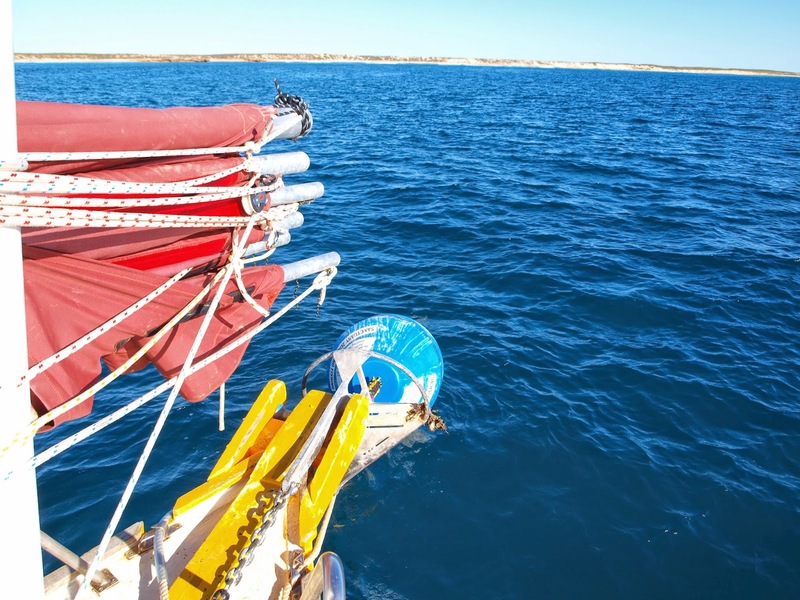 Now days it is a busy tourism hub for the Ningaloo reef with several charter companies based there. We’ve been to Exmouth by car and the marina is known to be overpriced with no known good anchorage nearby, thus none of the Carnarvon cruisers, including us, are stopping there. Only a dozen miles beyond are the twin Muiron Islands, no great anchorage but had several government installed mooring balls which we intended to stay the night. Against the rules, but what can I say? We're anarchists.. Crossing from the cape towards the islands Ashiki’s course made good was 20˚ more upwind than her compass course (bows pointing 20˚ different to her GPS direction). Odd, leeway usually means drifting downwind, not into it! Then it occurred to me there was a big cross current pushing us to windward so needed to point her more downwind to maintain the course. Something I was not used to being from down south as currents and tides are much bigger up here. We were moored by 3pm a mile off the rugged islands after a fast sail (for a change!). first of several we saw. At this point you could say we entered the region known as the Pilbara, basically the heart of Australia's prosperity. 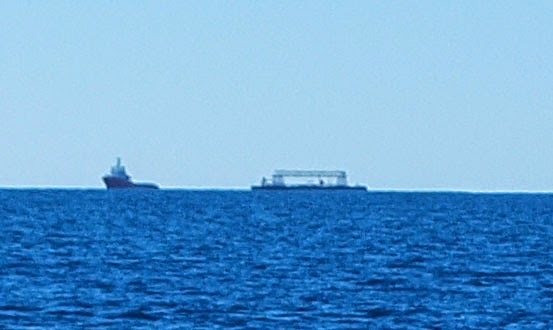 The biggest mining ports in the world are around here and as a first indicator of this, we started seeing large industrial structures being towed from the direction of Asia. The bone of contention in Perth, mining companies opting to source fabrication in SE Asia where a welder may work for $20k/year (in Singapore) compared to a welder in Perth being paid approximately 5 times that..
Today was the beginning of the new sailing strategy. It's simple, if below 4 knots, raise a panel. 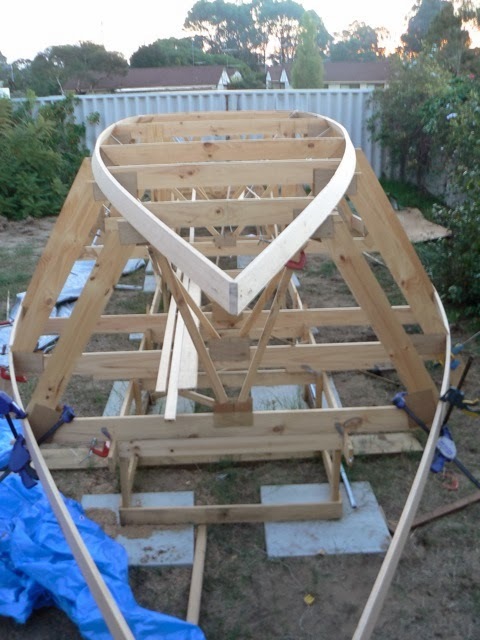 In the past we were happy to loaf along at 3.5 knots but with still a panel or two left to raise, mainly through energy conservation (my energy that is), alright then, laziness. No more, to make each leg a day sail demands a certain minimum speed to get to anchor before sunset. It paid off, today we made anchor with a 4.5 knot average - this is fast for us.